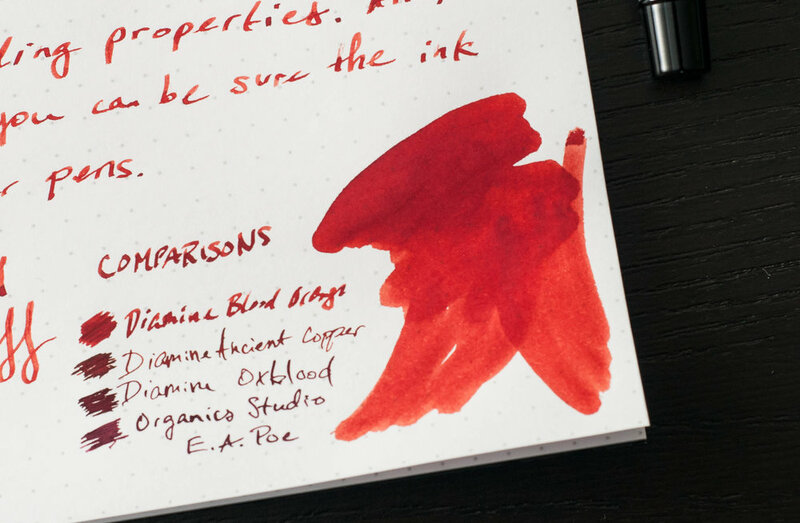 Diamine Blood Orange, part of a collection of inks released to celebrate the 150th anniversary of Diamine, is a stellar red-orange that hits a great balance between bright orange and murky blood. When you buy an ink from Diamine, you can be sure that it will perform well and be easy to clean. The same is true of Blood Orange. The first thing you probably noticed about this ink is the color. When you hear the words "blood orange," a wide array of colors come to mind. With this ink, I think Diamine has hit the perfect balance between all the colors that come to mind in this combination. It's a medium blood red mixed with just enough bright orange to make the ink pop. It's a great color, but probably not work-friendly. It's perfect for Halloween, though. Like all Diamine inks I've used, the flow is great. It starts immediately and doesn't have any issues with skipping or starting. In the pens I've tried with this ink, it hits the middle of the road in terms of ink flow. One of the pens I tried is a dry writer, and this ink did just fine with lubricating the nib and providing enough ink to form consistent and reliable lines. I haven't noticed any feathering when using broad nibs and good paper (by good I mean anything 80gsm or higher), but it does start to feather a bit on cheap copy paper. Being an orange-red, the show-through is also minimal. In most cases, you can't see any ghosting or ink spots on the back side of the page. One of my favorite features of any ink is the shading, and this ink doesn't disappoint. It's not a dramatic amount of shading, but it's enough to move from a light red-orange to a darker blood-orange color. The fading back and forth is really pretty, and I enjoy it a lot. It's very similar to Diamine Ancient Copper in terms of shading, but lighter and with more orange tones. Overall, I'm really impressed by Blood Orange and have enjoyed using it in a variety of pens. It looks great in broad or specialty nibs, but the character still shows through in small nibs. If the color appeals to you, I highly recommend picking this up. You can order this ink in a special 40ml bottle or a 20-pack of cartridges. Posted on October 11, 2017 by Jeff Abbott and filed under Diamine, Ink Reviews.